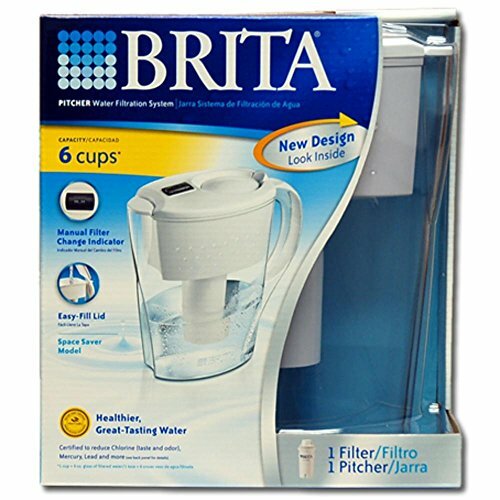 Enjoy healthier, great-tasting water for pennies per gallon with this Brita® Space Saver Water Filter Pitcher in a refreshing white shade. This home water filter system helps reduce zinc, chlorine taste and odor, copper, mercury and cadmium, often found in tap water. For optimal performance, the electronic indicator helps you know when to replace the advanced filter, which can be changed quickly and leaves no black flecks in your water. This filter pitcher features a flip-top lid for no-fuss refilling and a smooth basic handle to support easier pouring. The small, 6-cup capacity is perfect for use at home, in the dorm or at work and the streamlined design helps maximize space on a countertop or in the refrigerator. Plus 1 water filter can replace up to 300 standard 16.9-ounce water bottles, helping to cut down on plastic waste and save you money. Get great taste, less waste and more savings from Brita®.